This deliciously simple supper dish is cooked in one pan. 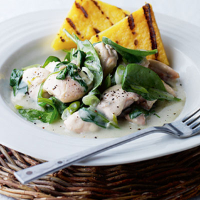 It is ideal for teaming with griddled polenta to soak up the creamy cheese sauce. Cut each thigh fillet into quarters. Heat the oil in a large frying pan, add half the chicken and fry quickly for about 5 minutes, until pale golden. Drain, then fry the remainder. Return all the chicken to the pan with the white parts of the salad onions (reserving the chopped green parts) and plenty of black pepper. Fry gently for about 5 minutes until the chicken is cooked through. Stir in the crème fraîche and scatter over the cheese. Add the spinach, a handful at a time, together with the green onion tops, and stir. Allow the spinach to wilt and the sauce to warm through, developing a creamy consistency. Sprinkle with a little freshly grated nutmeg and serve immediately with griddled polenta pieces (see Cook’s tip), macaroni or rice. To cook polenta, simply follow the pack instructions and leave to set in a lined baking tray. Cut into triangles and chargrill on a very hot griddle pan, brushed with olive oil, for 1 minute on each side, or until golden brown. A white Burgundy is ideal for serving with this rich dish.